Poster for 'Visions of Craft 1972-1993', a Crafts Council exhibition held at the Crafts Council Gallery, 44a Pentonville Road, London, from 18 March to 9 May 1993, then toured regionally. 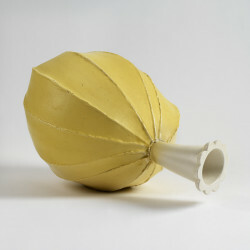 This exhibition showed work collected by the Crafts Council from 1972 to 1993. This Collection touched on all the main strands of development in the crafts in this period. The poster, designed by John Rushworth, Pentagram, is one in a set of four, each features a maker with their work from the Collection where this features Richard Slee's 'Pumpkin Pot' (P378), 1986. Photography by Nigel Parry. Printed by Penshurst Press.